This week I read a couple of articles on US Life Expectancy trends that got me curious about the situation in Australia…the articles were written by Paul Krugman and Aaron Carroll and basically implied that life expectancies aren’t increasing as much as everyone thinks and if you think that the age pension age should be lifted because of these beliefs then think again. I managed to track down an interesting report by the Australian Institute of Health and Welfare which does go into some detail about the status of Australian health as well as an interesting section on life expectancy. 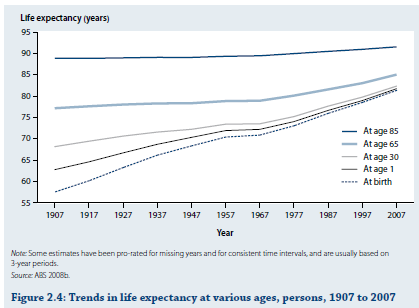 Life expectancy at Age 65 has improved quite significantly over the last 40 years…it has gone from an expected life to age 79-80 to age 85…a 5 year improvement…which isn’t bad. As a result of the 3rd point, perhaps there could be an argument for increasing the age pension starting age by 5 years…from age 65 to age 70. But since the late 1960s the age pension has gone through many changes already, most significantly, means testing has come to the fore as well as an improved superannuation system. So whilst the life expectancy for someone aged 65 is marginally better overall, I’m guessing fairly confidently that the life expectancy is biased by the wealthy (just as it is in the USA). And when you consider that the wealthier people of Australia can’t get full age pension anyway thanks to the means testing then they are already penalised. For the not so wealthy, I’m also guessing (like in the US) that the life expectancy for them isn’t really that different to the overall life expectancy from 40 years ago, so the argument for increasing the pension age based on life expectancy alone is probably a fairly weak one.